It is important to remember as Christian’s we are under the new testament covenant of grace, and not mix the free gift of grace with the law. Paul asked the Galatians, ” Are ye so foolish, having begun in the Spirit, are ye now made perfect by the flesh?” Galatians 3:3. “Therefore we conclude that a man is justified by faith without the deeds of the law. ” Romans 3:28. Jesus compared mixing faith with works, like mixing leaven into bread. “Then understood they how that he bade them not beware of the leaven of bread, but of the doctrine of the Pharisees and of the Sadducees.” Matthew 16:12. Their doctrine is still preached today, the doctrine of righteousness through works of our own. Lets look at the difference between being under the law and under grace. 18If a man have a stubborn and rebellious son, which will not obey the voice of his father, or the voice of his mother, and that, when they have chastened him, will not hearken unto them:19Then shall his father and his mother lay hold on him, and bring him out unto the elders of his city, and unto the gate of his place;20And they shall say unto the elders of his city, This our son is stubborn and rebellious, he will not obey our voice; he is a glutton, and a drunkard. 21And all the men of his city shall stone him with stones, that he die: so shalt thou put evil away from among you; and all Israel shall hear, and fear. 11And he said, A certain man had two sons:12And the younger of them said to his father, Father, give me the portion of goods that falleth to me. And he divided unto them his living.13And not many days after the younger son gathered all together, and took his journey into a far country, and there wasted his substance with riotous living.14And when he had spent all, there arose a mighty famine in that land; and he began to be in want.15And he went and joined himself to a citizen of that country; and he sent him into his fields to feed swine.16And he would fain have filled his belly with the husks that the swine did eat: and no man gave unto him.17And when he came to himself, he said, How many hired servants of my father’s have bread enough and to spare, and I perish with hunger!18I will arise and go to my father, and will say unto him, Father, I have sinned against heaven, and before thee,19And am no more worthy to be called thy son: make me as one of thy hired servants.20And he arose, and came to his father. But when he was yet a great way off, his father saw him, and had compassion, and ran, and fell on his neck, and kissed him. Under the law, the rebellious son was taken by his parents and stoned to death. Under grace, the same rebellious son is ran to by his father, who throws his arms around him with hugs and kisses. Lets look at one more example of law and grace. Leviticus 20:10And the man that committeth adultery with another man’s wife, even he that committeth adultery with his neighbour’s wife, the adulterer and the adulteress shall surely be put to death. And the scribes and Pharisees brought unto him a woman taken in adultery; and when they had set her in the midst,4They say unto him, Master, this woman was taken in adultery, in the very act.5Now Moses in the law commanded us, that such should be stoned: but what sayest thou?6This they said, tempting him, that they might have to accuse him. But Jesus stooped down, and with his finger wrote on the ground, as though he heard them not.7So when they continued asking him, he lifted up himself, and said unto them, He that is without sin among you, let him first cast a stone at her.8And again he stooped down, and wrote on the ground.9And they which heard it, being convicted by their own conscience, went out one by one, beginning at the eldest, even unto the last: and Jesus was left alone, and the woman standing in the midst.10When Jesus had lifted up himself, and saw none but the woman, he said unto her, Woman, where are those thine accusers? hath no man condemned thee?11She said, No man, Lord. And Jesus said unto her, Neither do I condemn thee: go, and sin no more. 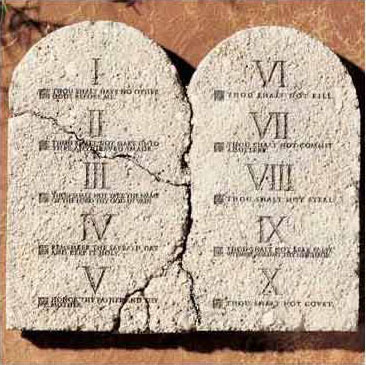 Jesus himself wrote the ten commandments on stone, and delivered them to Moses to give to the people. Here, when confronted with the ridged requirements of these same laws, we do not find Jesus pointing to the tablets engraved in stone, instead we find him stooping down and writing in the dust, and showing compassion and forgiveness. Lets all live under that same new covenant of compassion, and trust in the finished work of our Lord, and not mix grace with the law. Galatians 2: 21I do not frustrate the grace of God: for if righteousness come by the law, then Christ is dead in vain. So, I’ll ask you if it’s OK ,now that you have grace, to commit adultery or to sin? If you answer it’s OK to murder, lie, dishonor your parents or commit adultery your theory stands up, we can just have compassion on the man who is molesting children. and not require him to stop sinning. However; if you say it is not OK, I would ask you why. If you tell me it’s not OK because God said not to do it because it is a sin, it’s evil, and it hurts people……then you are mixing “law with grace” are you not? A child molester who is not covered by the blood of Christ has the law of man and God to answer to. A person who thinks about molesting children, but never acts on it has only God to answer to. Jesus did not come to do away with the law but to amplify it. We sometimes think if we keep from committing a big sin, we are OK. Jesus said if you look at a woman and lust after her you have committed adultery. Also Matthew 5: 21Ye have heard that it was said of them of old time, Thou shalt not kill; and whosoever shall kill shall be in danger of the judgment:22But I say unto you, That whosoever is angry with his brother without a cause shall be in danger of the judgment: and whosoever shall say to his brother, Raca, shall be in danger of the council: but whosoever shall say, Thou fool, shall be in danger of hell fire. People that do harm to others should be locked up. People that call someone a fool, are just as guilty in God’s eyes, so I am thankful to be under grace apart from the law. How can “people that call someone a fool be guilty” if they are under grace apart from the law? Guilty of what? Breaking the law?